One of the first Top 40 stations in the U.S., KLIF was also one of the most popular. The brainchild of radio pioneer Gordon McLendon, KLIF dominated the Dallas-Fort Worth radio market in the '50s, '60s and early '70s with hit music, personality jocks, a top-notch news department and aggressive promotion. Said one broadcast executive of KLIF, "it was a mountain, a station people talked around the world ... there was a sense something was happening there all the time." One of the KLIF jocks during this golden era was Ken Knox. He did morning drive from 1958 to 1960, followed by a short stint in late mornings before departing in 1961. In addition to his on-air duties, Knox also appeared in three movies filmed in Texas: The Giant Gila Monster (1959), My Dog, Buddy (1960) and Beyond the Time Barrier (1960). Knox, who also jocked in Dallas at KILN, KBOX, KTLC-KMEZ and KCNC, died in 1988 at the age of 73. Included on this aircheck is a clip from Jimmie Fidler, the acerbic Hollywood gossip columnist. At its peak in 1950, Fidler`s radio show appeared on 486 radio stations and was heard by an estimated 40 million. You`ll also hear KLIF JetStream News with Jack Terry. Enjoy Ken Knox on KLIF here. Imagine a time before morning "zoos," before wake-up teams, before all-day traffic. 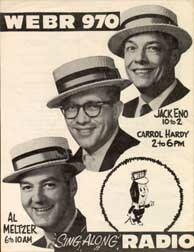 That was morning radio in 1961. 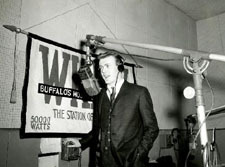 In the case of WEBR Buffalo, New York, it was one deejay, one newsman who also doubled on sports, and what then was a groundbreaking innovation, a traffic reporter in a helicopter. No raunchy humour here, and in this case no rock 'n' roll either. While this is a rock radio site, now and then it's interesting to see what non-rock radio stations were doing way back when. This aircheck is a true period piece and is fascinating from both a radio and historical perspective. Featured on this aircheck is pioneering helicopter traffic reporter Jack Sharpe, a member of the Buffalo Broadcast Pioneers Hall of Fame. The aircheck begins with the conclusion of Jim Curtis's 8 a.m. newscast. The program host is Al Meltzer. Hear him on WEBR in 1961 here. Let's take a ride on the Night Train! Alan Fredericks was a true rock radio legend, a deejay who played the "New York sound" of doo-wop music in the 1950s and '60s on his Night Train show on New York and area stations WGBB, WHOM and WADO. Former WCBS-FM program director Joe McCoy told David Hinckley of the New York Daily News, "he was the guy who championed the group sound after it was basically dead on the radio." Fredericks left radio in 1966, moving to Travel Weekly where he became one of the most respected travel editors in the U.S. But he was able to revive the Night Train in the '80s and '90s, when he filled in for Don K. Reed on The Doo-Wop Shop on WCBS-FM, and also made appearances on that station's Radio Greats Reunions. He died July 31, 2005, at the age of 70. 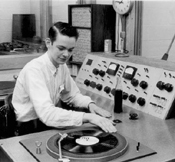 In 1961, Fredericks was playing doo-wop records from 11-midnight every Saturday night at WADO. The show was sponsored by Times Square Records, then one of New York's most popular record shops. The following aircheck has survived through the years and we are happy to present it on Rock Radio Scrapbook. Hear Alan Fredericks on WADO here. It's opening day, the Red Sox are getting ready to play, and Fenway in the Morning is starting your day at WMEX. Fenway was actually Ed Hider, one of a string of jocks to use the Fenway moniker at WMEX, which followed a common practice of the time of using "house names" for deejays. Enjoy Fenway on WMEX from April 11, 1961 (Pt. 1) here. Enjoy Fenway on WMEX from April 11, 1961 (Pt. 2) here. It's hard to imagine the history of Boston radio without Carl DeSuze. This urbane announcer ruled as WBZ's morning host for some four decades, waking up folks along the North American eastern seaboard through nine U.S. presidents from Roosevelt to Reagan. 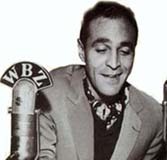 DeSuze arrived at WBZ in April, 1942 after graduating from Bowdoin College and stints at several Maine stations, including WGAN Portland. For 43 years, the man known as New England's Alarm Clock entertained with a unique brand of personality radio long-since vanished from the commercial airwaves. He commanded high ratings even after 'BZ's switch to Top 40 in the 1960s. Widely-travelled, and a lover of all things European, DeSuze interviewed many celebrities, lectured, and wrote for publications like Atlantic Monthly, Yankee Magazine and the Boston Globe. DeSuze retired from WBZ in 1985. He died April 30, 1998, less than two years after participating in WBZ's 75th anniversary celebration in September, 1996. He was 83. Enjoy Carl DeSuze (Pt. 1) here. Enjoy Carl DeSuze (Pt. 2) here. Known in its early days as The Wonder Station - and Syracuse's leading Top 40 station during the 1960s - WNDR had a lot of wonderful talent pass through its doors. Among those to grace the WNDR microphone were Joey Reynolds, Bud Ballou, Dusty Rhodes, Peter C. Cavanaugh, Dan Leonard, Bobby Ryan, Russ Syracuse, Don Bayley, Jim O'Brien, Don Bombard (later known as Bob Shannon) and Joe Galuski. Also at WNDR was Terry Mann, who would go on to later success at CHUM, CKFH and WKBW - the only jock to work at all three. He passed away in 1973 of diabetes-related complications at the young age of 36. Enjoy Terry Mann on WNDR here. 1050 CHUM ruled the roost in Toronto Top 40 radio for years, but it was not for lack of competition. In the '70s and '80s there was CFTR, in the late '60s into the mid-'70s there was CKFH. But before all that there was CKEY, a Top 40 outlet from the late '50s to 1965. More than a few leading Toronto radio deejays appeared there including Al Boliska, Duff Roman, Glenn Walters and J.P. Finnegan. Also on the air at 'EY was Ray Starr, who held down the early-evening slot in the early '60s. Few airchecks survive from that period, however, but this one of Starr does. CKEY eventually moved to a full-service MOR format in 1965, returning to rock 'n' roll in 1984 when it went to oldies first as Solid Gold CKEY then as KEY 590. That ended in 1991 with a switch to country and a call-letter change to CKYC. But CKEY's early years as a Top 40 station will not soon be forgotten. To hear Ray Starr, click here. It's a long aircheck from a long-ago time. In 1961, Pittsburgh teenager Paul Carlson and some friends holed up in a Buffalo hotel room to tape WKBW for 24 consecutive hours. The result was a marvellous audio time capsule of one of North America's most popular Top 40 stations during its early years as a hit music station. The entire scoped recording is available in our 24 Hours of 'KB section, but John Troll of Rewound Radio has restored portions of it. Here's Parts 1 & 2 of the Johnny Barrett show, which began the 24-hour recording at 12:22 p.m. on July 24, 1961. Enjoy Johnny Barrett on WKBW from July 24, 1961 (Pt. 1, UNSCOPED) here. Enjoy Johnny Barrett on WKBW from July 24, 1961 (Pt. 2, UNSCOPED) here. Ask most people to name just one CHUM personality from its illustrious history, chances are they'll say Jay Nelson. And for good reason, too. For 17 years, beginning in 1963, Nelson was the highly-rated morning man during CHUM's glory years of the '60s and '70s. But the fact is, he left another highly-rated and successful station to come to CHUM. From 1961 to 1963, Nelson was morning man at WKBW, which was establishing itself as one of the greatest Top 40 stations of all time. The Scranton, Pennsylvania, native, whose real name was Frank Coxe, was almost rejected from the CHUM job because he "sounded too American." Nelson replied "well, I am American." Nelson died February 18, 1994. From New York to L.A. was a big hit for Patsy Gallant in the 1970s. But Tom Shannon's theme song might be entitled From Buffalo to Detroit. Shannon shuffled between Buffalo and Detroit throughout much of his radio career, with a few stops in other locales. His Buffalo addresses have included WKBW twice), WGR (twice) and Oldies 104 (WHTT-FM). He has appeared in Windsor-Detroit on CKLW (also twice) along with several other Motor City stations. In 1961, Shannon was at WKBW in the 6-9 p.m. spot, but on this aircheck he's filling in for Russ Syracuse in the 9-noon shift. Enjoy Tom Shannon on WKBW from July 25, 1961, Pt. 1 (UNSCOPED) here. Enjoy Tom Shannon on WKBW from July 25, 1961, Pt. 2 (UNSCOPED) here. Enjoy Tom Shannon on WKBW from July 25, 1961, Pt. 3 (UNSCOPED) here. Many remember Sandy Hoyt from his years as an easy-listening announcer on CHFI-FM. But did you know he was once a Top 40 jock? In 1961, Hoyt held down the evening shift at CJCH Halifax - one of the Atlantic region's more prominent Top 40 stations. It was called The Best-Seller Show. It's hard to believe this Sandy Hoyt is the same person entertained folks in a more conversational style for years in Toronto. Hoyt, a native of New Glasgow, Nova Scotia, also jocked at CFTR Toronto, CIGO Port Hawkesbury, Nova Scotia, and at stations in Chatham, Ontario, and Kitchener, Ontario. He did a lot of TV work too, including hosting Global's telecast of the Santa Claus parade from 1985 to 1997. He was also the announcer for The $128,000 Question and host of the game shows The Joke's On Us and Split Second. Hoyt died of a brain tumour August 5, 2002. He was 63. Lots of great tunes and jingles and we also have the news headlines in this aircheck. Check out the awkwardly worded seat-belt commercial at the 1:57 mark. Rock Radio Scrapbook presents Sandy Hoyt with the Best-Seller Show on CJCH here. Here's more of Ed Hider with Fenway in the Morning on WMEX! Enjoy Fenway on WMEX from September 13, 1961 here. Before his 32-year (1965-2007) stay in the Big Apple, Ron Lundy jocked in the Gateway to the West. Talent: PAT PATTERSON "THE FAT CAT"
Pat Patterson is a North Carolina broadcasting legend, but he also starred in quite a few other markets. Patterson got his start in radio at a local AM station while at Kansas State, from which he graduated in 1958. He went on to work at WGR Buffalo, WPTR Albany, New York, WPRO and WICE Providence, Rhode Island, and WCOP and WHDH Boston, before arriving at WKIX Raleigh, North Carolina., in 1969. He spent five years there as morning man and program director before leaving for WHDH Boston. 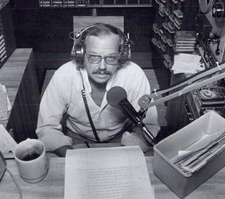 He returned to the Tar Heel State at WQDR Raleigh from 1977 to 1982. Following a gig at KLUF Houston, he returned to WKIX from 1988 to 1990, then did a talk show at WDNC Chapel Hill from 1990 to 1997. During his time in Raleigh, Patterson won four Billboard awards for Best Morning Personality in a Medium Market and Best A.M. Personality in a Major Market. He was named to the North Carolina Broadcasting Hall of Fame in 2010, having been nominated three times previously. Pat Patterson died January 15, 2017. He was 81. Enjoy Pat Patterson "The Fat Cat" (UNSCOPED) here. Enjoy Pat Patterson "The Fat Cat" (SCOPED) here. 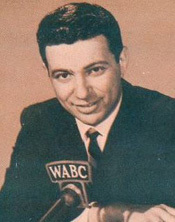 "Big Dan here, laughin' and scratchin'"
Dan Ingram got his start at WABC in 1961 and was the last voice heard on the station when the music era ended on May 10, 1982. Most of Ingram's tenure at WABC was spent in afternoon drive, where he entertained millions during his two-decade stay at the legendary Top 40 outlet. Enjoy an early WABC show with Dan Ingram here. Memories, fading ones at that, are all we have to go by. 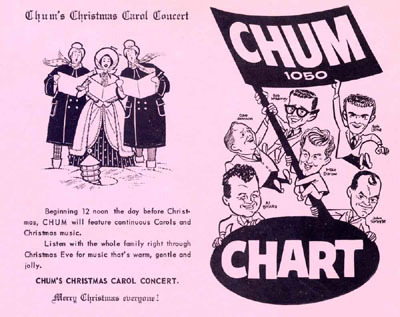 Even though it is recognized as one of North America's pioneer Top 40 stations, much of CHUM's early audio history seems to have simply vanished. Relatively few CHUM airchecks from the pre-1970 period are in active circulation. While some may be in private collections, that isn't much good to the masses of us who want to hear them. Bob Laine and Doug Thompson have been finding plenty of CHUM airchecks in that station's archives and sending them to us, but we'd also like to uncover some of the ones listeners may have recorded. A collector in Michigan named Tom Sanders sent us an aircheck of afternoon drive host Mike Darow at CHUM in 1961. This is one of only two airchecks of Darow that we know about and one of only a handful from the early days of CHUM. Not even a single aircheck of Al Boliska's CHUM morning show is known to exist. But we believe someone, somewhere, must have tapes of those early CHUM shows. Can you help? Rock Radio Scrapbook presents Mike Darow here.